View More In Cookware Accessories - Page 7. 1. Simmering a little water for one minute helps with cleaning. 2. Wash cast iron by hand with our chainmail scrubber. Just press a little harder to remove crusty bits. 3. Dry promptly and thoroughly with a lint-free cloth or paper towel. 4. Rub with a very light layer of cooking oil or seasoning spray, preferably while the cookware is still warm. 5. Hang or store cookware in a dry place. 1. Some dark residue on paper towel or cloth you may notice when cleaning is just seasoning reacting to foods that may be slightly acidic or alkaline and will disappear with regular use and care. 2. Keep cast iron cookware away from dishwasher. ★【PREMIUM QUALITY AND DURABILITY】 - This cast iron skillet cleaner is made of Premium Grade Never Rusting 316L Stainless steel for cleaning all your cast iron cookware, food grade, SOFT, SMOOTH ENOUGH for pans, DISHWASHER SAFE, which is the best replacement of household cleaning brushes tool, steel wool or pan scrapers. Built to last as long as your cast iron products. ★【EASY TO GRIP, SAVE CLEANING TIME】 - This cast iron scrubber or household scouring pads follows hand profile for easy handling, easily control of the cleaning strength, protect the seasoning from being stripped off. Keep the flavor, take the grit, all you need is warm water. No soap or harsh detergents needed. Our new design improves the efficiency of cleaning, saves your most cleaning time. ★【REPLACEABLE SPONGE】 - The sponge inside can be replaced by any knid of your kitchen scrub sponges around 4.4*2.7*1.2 inch, easiliy detachable. When the sponge get dirty, all you have to do is repleacing it and you're good to go as a new one. Perfect household cleaning tool, grilling BBQ Utensil, grill scrapers , outdoor cooking accessories. 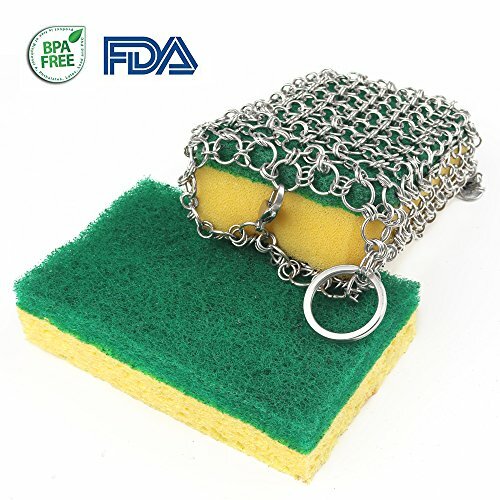 ★【MULTI-USE】- Chainmail SCRUBBER,this multi-purpose scrubber as bbq grill brush,kitchen brush,pan scraper,scrub brush,scourer,can be used for cast iron, sink,glassware, stainless steel, a hibachi,a pizza stone,a pie pan, plates, baking sheets, a tea pot, cookie sheets, kitchen faucet,cauldrons, tortilla press, a waffle maker, a Dutch oven, woks, casserole dishes, and griddle cleaner,house cleaning. If you have any questions about this product by Makerfun, contact us by completing and submitting the form below. If you are looking for a specif part number, please include it with your message.